Building on local assets to fashion community based enterprises is well illustrated in the case of the Wolio pottery project in Buton, Southeast Sulawesi. In 2004 a group of women approached local NGO Sintesa to help improve their local pottery manufacture practices. 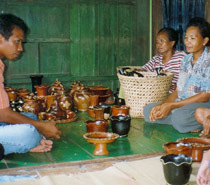 Sintesa drew on its contacts with an Indonesian NGO improving Lombok Island pottery to a high standard. Following a series of training sessions two groups of local women potters were formed. (Kelompok Pengrajin Gerabah) with 8 women from the settlement of Lipu and 7 women from neighbouring KatoBengke, both Wolio speaking communities in the main town of Bau Bau on Buton Island. Since then the women have dramatically improved the quality, durability and decorative designs of their pottery. Sourcing high quality materials locally, they now use manual pottery wheels to improve shape; obtain river sand in place of beach sand for a better mix, use higher temperatures for firing their pots and have experimented with a range of glazes to improve finish. A combination of techniques using oils, sawdust, kerosene, ochres, tamarind juice, and padi husk provide attractive patinas and shiny finishes. Sales of the pottery are conveniently made from member kiosks and home based stores, but NGO Sintesa has also assisted the groups by providing space in their commercial office downtown where initial interest and sales to hotels and traders has been encouraging. To facilitate their enterprise activities, NGO Sintesa loaned the groups Rp25million ($3,500) for production to be recouped through marketing. The funds are combined with regular group savings practices to provide a source of materials credit. The initial success of the Wolio Pottery enterprises has demonstrated the generative possibilities of ABCD, and the opportunities for combining local skills with creative training and support for sustaining enterprise growth.